NEWSFLASH… Villa will be safe! There’s no need for any sleepless nights. Villa are going to survive. You heard it here first. Four of MOMS writers have sat down and faced the potential horror that is the BBC Premiership Predictor and played out the rest of the season. 2. 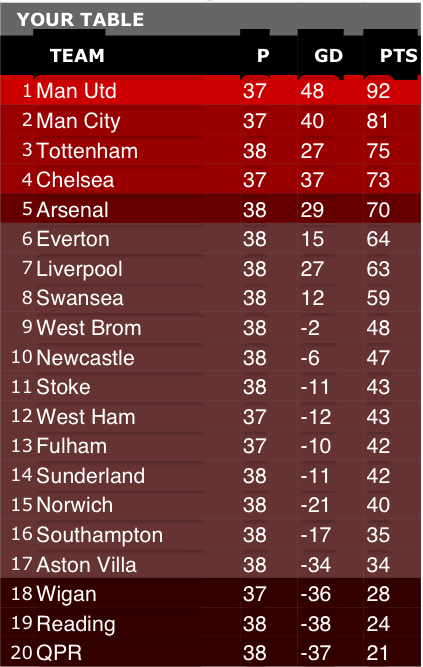 No team is predicted by everyone to get relegated, so it’s going to be a close one. It’ll be three from QPR, Wigan, Southampton, Reading and Norwich though. 3. To Norwich fans waiting to enjoy laughing at Lambert for leaving them and relegating Villa, two of our predictors have Norwich down for a dramatic late slide out of the Premiership. Fulham may also be in contention for a late slide, if they’re not careful. 4. Spurs could finish second. Three predictors have them down for the runner’s up spot (weren’t they a team that Villa were once in the same ballpark of). They seem to be on song at the moment while Manchester City look like a team who know they’ve blown their season. 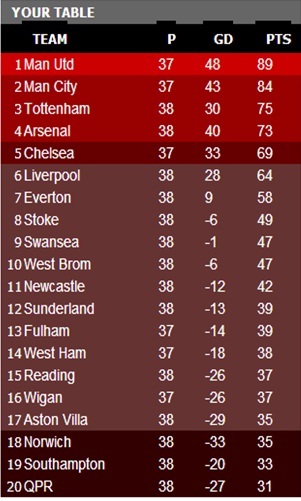 * – Please note some games are missing from the BBC Predictor at the moment, but they don’t effect Villa’s plight in the below tables. MOMS’ founder David has taken a realistic yet hopeful approach to his predictions. Home wins against QPR, Fulham and an away win at Norwich, plus a bunch of five hard-fought draws will do the trick. If Villa hit the 38 point mark that should be enough. Stephen, the writer of the regular MOMS column ‘What We Learnt This Week…’ , has gone for a more eccentric ‘all or nothing approach’ with five wins and five defeats. 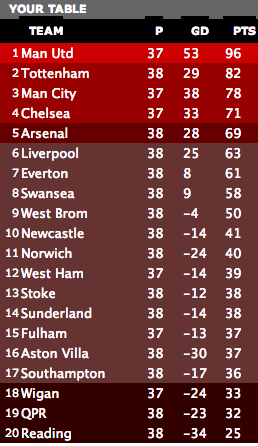 Elliot’s call is too close for comfort, relying on the faltering fortunes of Norwich and Southampton. If somebody told you now that Villa would finish below Wigan and Reading at the end of the season, you’d think it would be game over. Apparently not. The BBC doesn’t help matters here by having a Wigan game missing from the fixtures list, but lets say they win it, then they just need to beat Villa at home on the last day of the season to survive. Could you handle going to Wigan on the last day of the season knowing we’d need a result to make sure of our survival? “It would seem a couple of goals here and there, and that last-min cheeky away win on the closing day of the season will secure our place, ” Kerry boldly predicts. By the looks of it she has very little time for QPR and Reading’s chances of survival. Rednapp’s targeting 37 points for safety…he’ll only end up 16 short then! So it looks like it’s between Villa and Wigan for the final spot. Lewis, who does the MOMS match preview ‘The Villa Appetiser’, has Villa finishing on 37 points, the target that Harry Rednapp set for QPR. A win for Villa or QPR in their fixture against each other, next week, will go along way to making that target realistic for at least one of the teams. Again though, it looks like it’ll go down to the wire for Villa. 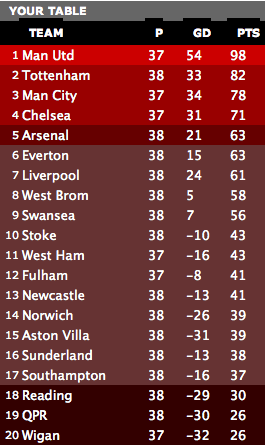 Looking at that predictor, we got the easiest run in out of the bottom 4! we can ease the pressure with a Win today. if we win today it takes off the pressure of winning at Wigan last game of the season ! Villa to finish on 36, with Wigan, Reading and Southampton going down. 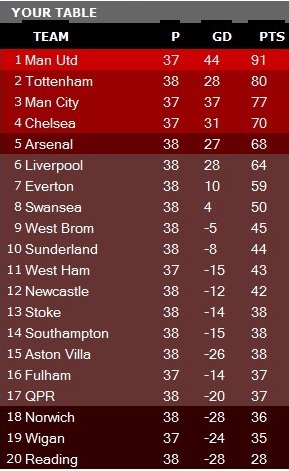 I’ve got Villa to finish on 39 points with Reading, Wigan and QPR going down.